Add rich, frothy texture and sweet, smoky taste to your beer by caramelizing alcohol’s natural sugars. The campfire is cracking, the marshmallows are getting toasty, and your cold beer is ready to undergo a flavor transformation. Pull this stainless steel rod out of the flames and stick it in that icy brew to create a rich, frothy treat. Yep, you read that right: Adding a little heat to your alcohol caramelizes the sugars, changing the texture and taste. 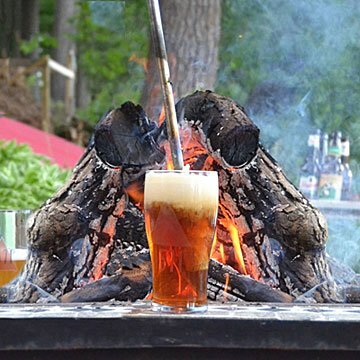 It's German tradition to plunge sizzling fire pokers into bocks—strong lagers that are ready to drink in chilly early spring—to add smoky sweetness and create a warmer, smoother mouthfeel. This modern take on the poker isn't sharp and has a real beer tap handle for safer gripping. It also comes apart for easy transport to a campsite, or from the kitchen to your fireplace or backyard BBQ pit. Try it with classic bocks, your own favorite beers, cocktails, or any drink containing sugar. (It's called a beer caramelizer, but we think it has hot chocolate written all over it.) Made in China. Stainless steel rod is removable and dishwasher safe. For best results use try with a stronger, darker beer with a higher sugar content. Fabulous product. He absolutely loves it and it is true to it's selling points and carmelizes the sugar to change the tastes of the beer. Looking forward to trying this out this winter some dark beers and a campfire. This is such a fun, unique gift! I can't wait to light a campfire and try it! I haven't had the chance to use it. I would have liked if a tasting printout was included, but I can print it off the website. Got it for my father for Christmas, best gift I've ever given him. He frequently loves to have guests over for BBQ and showing this off is always a must. Adds a bit of luxury to life. Can't wait for my brother-in-law to try it! I bought this gift for someone who greatly enjoys the outdoors, including sitting around a campfire at night. I thought this item would be a good gift for him. My son-in-law and daughter are great fans of craft beer. This will add another dimension to their experience of all things craft. I can't wait till they light a winter fire and heat up those sticks!